It’s just something about the way that freeze framed Ray Liotta fills the screen and drops the iconic quote, “For as long as I can remember, I always wanted to be a gangster.” It makes you want to slip on an oversized collared shirt, Rolex, and double breasted suit and see who’s playing at The Copacabana. Ready to watch it again? First, check out a few behind the scenes stories the cast shared during a reunion event at this year’s Tribeca Film Festival. Do we amuse you? We hope so. Having already collaborated on five projects together, including Mean Streets, Taxi Driver, and Raging Bull, Goodfellas came around deep into Scorsese’s creative relationship with De Niro. But he wasn’t able to play the lead because of his work in another project. “I thought I could play Jimmy, though,” he said about after he read the script. He also added that he, “recommended Ray Liotta for the role.” Thanks for that Bob. Fans of Goodfellas would be hard pressed to imagine anyone able to communicate Paulie’s silent ferocity in the masterful way that Paul Sorvino did, but the actor revealed he felt less-than-confident when he first got offered the part. 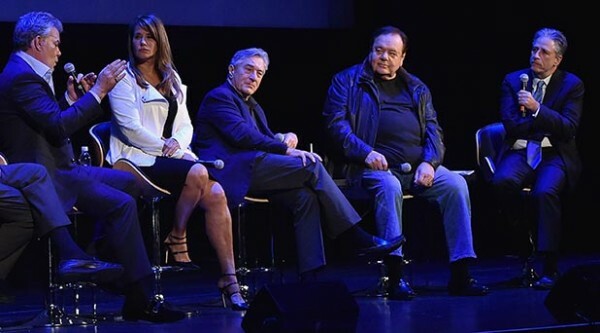 “I called my people and I tried to get out of it,” Sorvino admitted. “I didn’t think I could play the guy.” It wasn’t until days later, while straightening his tie in the mirror, that he saw the intensity necessary to play a crime boss. Goodfellas and like-minded gangster films may be accepted into the Italian identity now, but that wasn’t always the case. In a video message before the movie started, Martin Scorsese divulged that he and writer of the book, Nicholas Pileggi, were banned from their favorite Italian restaurant after the movie came out because the owner believed it “denigrated” his particular ethnic group. Everyone has heard stories of Robert De Niro’s method acting in action, whether it was gaining 60 pounds to play the later years in Raging Bull, or driving a cab in New York before filming Taxi Driver. Goodfellas has its own little story as well. In the infamous dinner scene with the mother of Joe Pesci’s character, Tommy DeVito, there’s a very particular way that Jimmy “The Gent” Conway pours out his ketchup, spinning it rather than pounding, which was the result of a phone call between De Niro and Henry Hill about what the former friend preferred. Fun fact: The role of Tommy’s mother was played by Scorsese’s mother, Catherine.